How tall is Luke Hemmings? Here are some information about Luke Hemmings's height. Luke Hemmings a band guitarist. 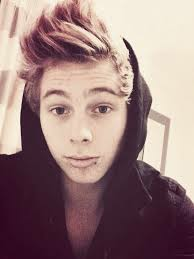 Luke was born on July 16, 1996 in Sydney, Australia. Luke Hemmings is a member of 5 Seconds Of Summer(5SOS). The height of Luke Hemmings is 6ft 2in, that makes him 187cm tall. Luke Hemmings's height is 6ft 2in or 187cm while I am 5ft 10in or 177cm. I am shorter compared to him. To find out how much shorter I am, we would have to subtract my height from Luke Hemmings's height. Therefore I am shorter to him for about 10cm. And see your physical height difference with Luke Hemmings. Trust me, i've met Luke and we're completely on eye range. Luke is 6"4 now. He's nothing below 5 feet so he couldn't be 5"9. I'm 5'1. How embarrassing! If I ever met him by some miracle (which I probably won't) he would have to crouch to hug me or whatever.... I hate being short. Luke is 6'4", he was only 17 and still growing when 5SOS got popular, so his height would change. Luke Hemmings is 6 feet 4 inches tall as of September 2015. Google said he is 1.77 m tall and Google also said that Ashton is 1.82 m tall which would say that Ashton is taller than Luke? Ashton is taller than Luke?!! thank you, everyone else is like 5'9 and im like uhh guys hes 6'4 ..
Luke is 6'1" a lot of sources and websites has stated this,besides ashton stated that his height was 6 feet,so they can't both be 5'11 in height bcoz Luke is significantly taller,furthermore ppl who met luke in person we're overly surprised with how tall he was,I doubt a 5'11" guy would impress someone as much. Why are we on eye range, why do i have to look straight at him instead of looking up at him. I'm 5'9" by the way. Yeah 5'11 isn't surprisingly tall unless they're like 15 or under, and everyone seems surprised at how tall Luke is in real life so he must be at least 6'0"
He can't be, why does he seem only as tall as his band mates? I'm Aussie, 16 and 173cm that's about 5'8 and I still would look short next to Luke. I'm still taller than most of my friends. You guys are lucky you're small! My doctor said I was going to be 6'2 - 6'4, my dad is 6'10 so it's valid. I want to find a boyfriend that's taller than me, but the chances are pretty low. I was not expecting as many comments here! THANK you:) and yes, embrace our height! Don't now why you're complaining. 5'7" is fairly tall for a female. The average Australian female is 5'4". And most tall girls I know wish they were shorter, since most men prefer shorter women. I am Belgian 16 year old girl and i am 6'0 feet. You are pretty tall for a 14 year old kid. Nice height. I do think Luke's height is 6'4". He cant be 5'11". luke is not as tall as everybody thinks he is but he is still tall, don't get me wrong. he is 6"2 with his quiff and without, he is 5"11. just cause he seems tall doesn't mean he's that tall and has to be 6"4. Yes I think that's what shocks people, they look taller than they actually do but anyways it's still a good height! I actually agree with you. People can check out their interview with Elvis Duran radio. They measured him. Its on YouTube. I personally couldn't agree more, lol. No he's 180cm (5ft 11inch (without quiff)) the Elvis Duran Show radio measured him during their interview (21st July 2014). There's a video on YouTube. They measured him on the elvis duran show only up to his forehead, and that isn't someone's real height. We don't go flat at the forehead, we go up, so it probably adds like 2/3 inches. So I would say he is around 6'2/6'3. Luke Hemmings is 6'4", he said so. Anyone can lie about their height. Just because he said so doesn't mean it's true. he just needs to stop growing. that is all. Luke Hemmings said on a social media website that he is 6' 4". There are a few pictures out there to prove he is nowhere near 6'4''. With Ryan Seacrest who is 5'8'' if you take of Lukes hair he looks about 5 inches taller so that would make him 6'1''. There is also a picture of him 5sos with Jimmy Kimmel who is 6ft at best and hes the same height, is on their twiiter. 6'1'' maybe but 6'4'' who must be having a laugh. Just because he said hes 6'4'' doesnt mean he is. Loads of guys lie about their height. I bet that measurement is with quiff so take of 4 inches and you get 6ft. Of course he is! Luke wont lie about his height. He is a kind man, that is why we love 5SOS. He is 6'4"! He is definitely 6'2 (188cm). People need to get 6'4 out of the question. All the men in my family are easily 6'2-6'6. I know what 6'4 looks like and he is not that tall. No offense to him, but he is lanky. Very lanky. Lanky people tend to look taller than they actually are! At maximum, he is 6', MAYBE 6'1. Being 6'1" myself, I know what a 6'1" guy looks like, and I'd say Luke is 6'1" at most. To say he's taller is fangirlism. That's bullsh!t and we both know it. I'm 5"6, and that sure as hello doesn't mean that to I know what everybody in the fvcking world who is 5"6 looks like, does it?? Whatever helps you sleep at night. If you wanna keep believing he's taller, you'll just be setting yourself up for disappointment if you ever see him in person. There's a couple of videos on youtube showing he isn't 6 feet 4! Why do the fangirls here keep saying he's 6'4"? He does not look 6'4". Look at pictures Jared Padalecki. Now that is a 6'4" guy. Is 6'1" or 6'2" not good enough for girls these days? Lukey is actually 1.93 metres/6.33 feet. 1.93 metres is 6'4". And if you ever see him up close in real life, prepare to be disappointed. I'm 14 only 5'3. My friends and I are the only short people. My whole family is really tall. But I'm just fun sized so it's all good.